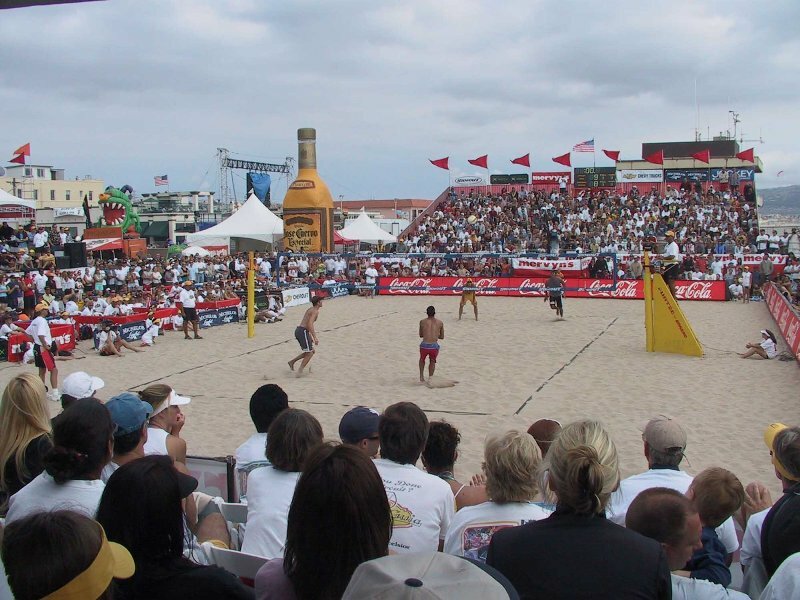 The AVP Hermosa Beach Open Volleyball Tournament starts Thursday, July 26 and runs through Sunday, July 29. General Admission is free. Visit avp.com for more details and VIP ticket information. The 2018 AVP Hermosa Beach Open Volleyball Tournament will be made up of 24 Main Draw teams for men and women. In addition to high-level volleyball, the tournament will include Sponsor Village, food and drink stations, the Jumpman Zone, a Bounce House for children, a ball-drawing station with Wilson, a rock wall for climbing, volley darts, a bungee run and more. Free. 8 a.m. – 6 p.m. through July 29. For more info or to purchase VIP tickets visit avp.com. Manhattan Beach Open Tennis Tournament presented by Audi Pacific. Prizes and trophies for all division winners. Single elimination. 8 a.m. – 8 p.m. through July 29. Live Oak Park, Mira Costa High School. Finals on Sunday will be at Manhattan Country Club. Get registered at citymb.info/mbotennis or call (310) 802-5448. Are you playing in the Manhattan Beach Open Tennis Tournament? If so don’t forget the opening night players’ party 6 – 9 p.m. Live music by Lisa Ritchie and beer by Simmzy’s. Manhattan Beach Art Center, 1560 Manhattan Beach Blvd., Manhattan Beach. For info and to see if you are on the guest list visit citymb.info/mbotennis or call (310) 802-5448. For over 20 years, the Redondo Pier Association has sponsored the biggest free summer concert series in the South Bay. Laurie Morvan Band will be rocking the Redondo Pier from 6 – 8 p.m. Blankets or low-backed beach chairs are encouraged. 100 Fisherman’s Wharf. Concert schedule is subject to change. For more details visit /redondopier.com. The Aerospace Players present Mary Poppins. Tickets $20-$24. 7 p.m. James Armstrong Theatre, 3330 Civic Center Dr., Torrance. To purchase tickets visit torranceca.gov/TCACTickets. For more details and future shows visit aeaclubs.org/theater or call the box office at (310) 781-7171. Read about what makes a city a city and then build your very own! For children and families. 3:30 – 4:30 p.m. Hermosa Beach Library, 550 Pier Ave., Hermosa Beach. For questions contact Kay at (310) 379-8475 or kwantuch@library.lacounty.gov. Shakespeare by the Sea’s presents The Winter’s Tale at Wilson Park Greek amphitheater area behind the skate park. Sloped lawn gets steeper the further you get from the playing space. Low beach chairs or blankets work best. Warm layered clothing recommended. 7 p.m. Wilson Park, 2200 Crenshaw Blvd., Torrance. Free. For more details visit shakespearebythesea.org. Day at the Beach is an extraordinary experience uniting 300 at-risk children with over 300 caring volunteer mentors for an inspiring one-on-one day filled with healthy interaction, fun, trust and heartfelt friendship. 9 a.m. – 3 p.m. Manhattan Beach at 8th Street and The Strand. $35 – $120. Sign up at Eventbrite. For more info visit psiloveyoufoundation.org. 5K Run & Walk at Dockweiler State Beach. Event proceeds will be split between the Sean Brock Foundation, which awards scholarships to the families of fallen or wounded service members, and the CalCPA Los Angeles Chapter, which awards scholarships to local college/university students studying accounting. Last year the chapter awarded more than $25,000 in scholarships. 9 a.m. Dockweiler State Beach, 12501 Vista Del Mar, Playa del Rey. Register at calcpa.org/charityrun. For info call Tracey Zink at (818) 546-3554 or tracey.zink@calcpa.org. Taking full-length practice tests under timed conditions is essential to being ready for the SAT test. A proctored practice exam will help your child build testing endurance and give you a real-time snapshot of their testing performance. This program is co-sponsored with Revolution Prep. Register for the SAT via this link: http://bit.ly/2MxIDnz. Remember to bring your approved calculator, pencil, water, and snack to your practice exam. 10 a.m. – 2 p.m. Manhattan Beach Library, 1320 Highland Ave., Manhattan Beach. For questions call the library at (310) 545-8595 or visit lacountylibrary.org. Relive your favorite memories and create new ones during Cabrillo Marine Aquarium’s Family Sandcastle Day. 10 a.m. – 3 p.m. Free and open to everyone. All you need to bring is your best sandcastle building tools, a little shovel and bucket, and your castle creativity to this fun beach event. Select a plot of sand, wet it down and build away. 10 a.m. – 3 p.m. Cabrillo Marine Aquarium, 3720 Stephen M. White Dr., San Pedro. For additional information call (310) 548-7562 or visit cabrillomarineaquarium.org. Plants sold on first-come, first-serve basis. Noon – 2 p.m. White Point Nature Preserve, 1600 W. Paseo del Mar, San Pedro. For more information, contact (M-F) 310-541-7613 or (S-S) 310-561-0917. White Light White Night is an event to remember, featuring a live musical concert, a decadent “Taste of L.A.” with samplings from restaurants throughout Los Angeles, silent and live auctions and special signature cocktails and wine. The evening is a true party, celebrating the triumphant spirit of the Walk With Sally children, and invites supporters to contribute to the organization’s life-altering mission. 5 p.m. The Top of the Plaza at Continental Park, 870 S. Nash Street, El Segundo. General admission $225. For questions and ticket info call (310) 322-3900 or visit walkwithsally.org. JKidz Club Summer Extravaganza. Bounce House, games, food, crafts, and raffles. Bubblemania and company. Open to kids ages 5 and under and their families. Free. 2 – 5 p.m. Valley Park, 2521 Valley Dr., Hermosa Beach. Freedom 4 U presents Career Path, helping teens discover their career direction. Career path is an opportunity for teens to hear from and interact with professionals from different careers. Each 90 minute career path meeting will consist of 6 – 7 careers represented, from a diverse selection of work ideas. Free. 3:30 – 5 p.m. Peninsula Center Library Community Room, 701 Silver Spur Rd., Rolling Hills Estates. To rsvp contact Greg: admin@freedomcommunity.com or call (800) 501-9801.